The peculiarly twisted contrail casts its shadow onto a thin sheet of cirrus cloud. Ice crystals in the same cirrus produce a 22 degree halo. Contrail shadows run counter to intuition. There is a strong feeling that the contrail is below the cirrus layer. That implies that the sun is shining upwards. Shadows are always cast downwards. 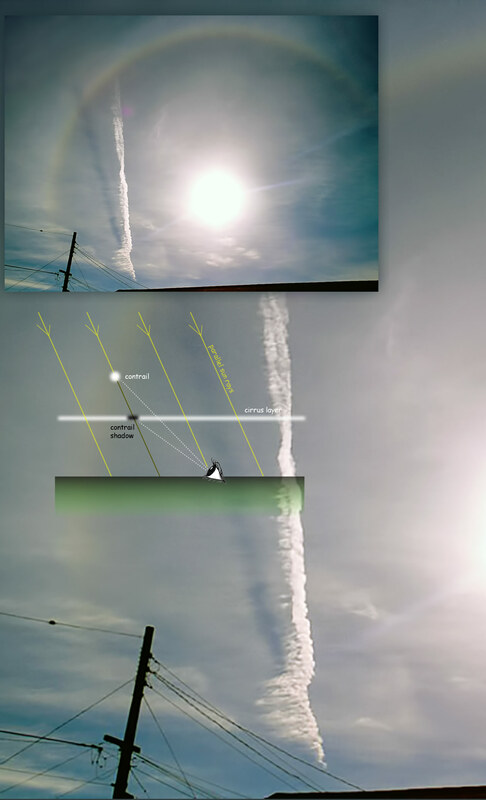 The schematic corresponding to the image shows the contrail appearing to the left of the sun ray reaching the eye. The contrail shadow is further left. There is a puzzle in the picture. The contrail merges with its shadow at lower left. The aircraft is either descending or the cirrus layer is tilted.